WBF Resort Okinawa, a company managing several hotels in Okinawa, opened its “Hotel Aqua Citta Naha by WBF” Thursday. Hotel Aqua Citta Naha is a 10-story building with 231 guest rooms – 65 double, 165 twin, and one universal room. On the 10th floor of the hotel, there is a “see-through swimming pool”, a first in Okinawa. 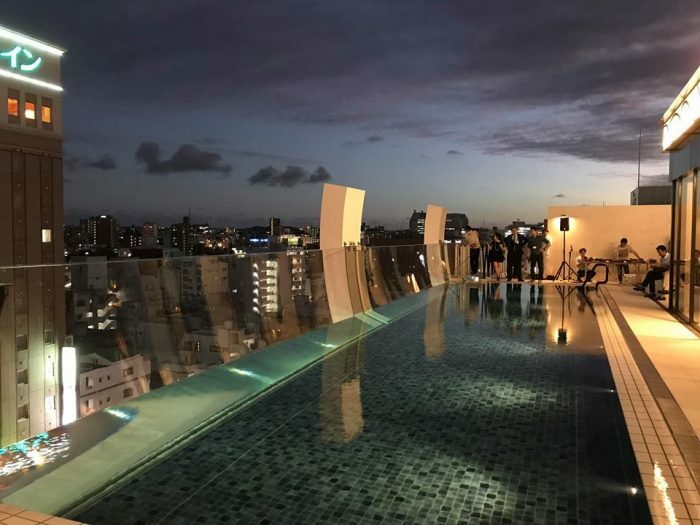 Customers can enjoy swimming in the pool while looking down at the cityscape of Naha. There’s also a bar, and jet-bath on the same floor. The 9th floor of the hotel is limited only for the guests, who can enjoy free drinks and snacks in its bar.